Here's your monthly roundup of free in-person #Tech4Good events. But first I'm going to show off on behalf of our NetSquared organizers. I have the very best job at TechSoup - I get to support our network of nonprofit technology event organizers. This remarkable cohort of 250 community builders are hosting monthly free workshops and networking events in more than 74 cities and they're doing it entirely as volunteers. 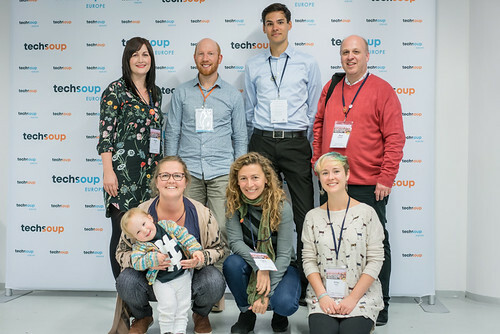 The NetSquared organizers' events help TechSoup deliver on our shared mission of ensuring that civil society has the tools and skills necessary to use technology effectively, and they're having a huge impact. In fact, last year we had almost 13,000 workshop RSVPs, and at each event we're helping to build and sustain a self-supporting community of practice for tech-minded nonprofit staffers. But I'm not the only one singing the praises of the NetSquared organizers. 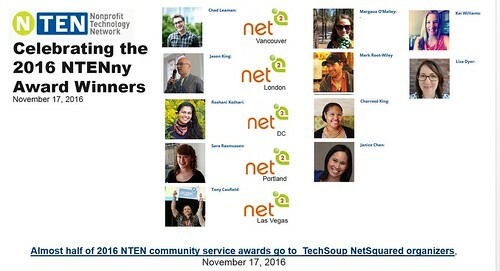 Our friends at NTEN give out NTENny Awards every year to recognize people making a significant contribution to the nonprofit tech community and once again close to half of the winners were affiliated with NetSquared and our Tech4Good meetups. Please join NTEN (and me!) in congratulating NTENny Award winners and NetSquared organizers Jason King (formerly of NetSquared London), Chad Leaman (NetSquared Vancouver), Roshani Kothari (NetSquared DC), Sarah Rasmussen (PDXtech4good), and Tony Caufield (Tech4Good Las Vegas). Being a NetSquared organizer isn't an exclusive club - anyone is welcome to join! Discover the benefits of being a group leader and apply to join. Raleigh-Durham, NC: Get Your Holiday Cheer On! Naples, FL: How to reach more people via video live streaming?